This tutorial series will teach you the basics of building an ASP.NET Web Forms application using ASP.NET 4.5 and Microsoft Visual Studio Express 2013 for Web. A Visual Studio 2013 project with C# source code is available to accompany this tutorial series. In this tutorial, you will modify the Wingtip Toys sample application to include error handling and error logging. Error handling will allow the application to gracefully handle errors and display error messages accordingly. Error logging will allow you to find and fix errors that have occurred. This tutorial builds on the previous tutorial "URL Routing" and is part of the Wingtip Toys tutorial series. How to add global error handling to the application's configuration. How to add error handling at the application, page, and code levels. How to log errors for later review. How to display error messages that do not compromise security. How to implement Error Logging Modules and Handlers (ELMAH) error logging. ASP.NET applications must be able to handle errors that occur during execution in a consistent manner. ASP.NET uses the common language runtime (CLR), which provides a way of notifying applications of errors in a uniform way. When an error occurs, an exception is thrown. An exception is any error, condition, or unexpected behavior that an application encounters. In the .NET Framework, an exception is an object that inherits from the System.Exception class. An exception is thrown from an area of code where a problem has occurred. The exception is passed up the call stack to a place where the application provides code to handle the exception. If the application does not handle the exception, the browser is forced to display the error details. As a best practice, handle errors in at the code level in Try/Catch/Finally blocks within your code. Try to place these blocks so that the user can correct problems in the context in which they occur. If the error handling blocks are too far away from where the error occurred, it becomes more difficult to provide users with the information they need to fix the problem. The Exception class is the base class from which exceptions inherit. Most exception objects are instances of some derived class of the Exception class, such as the SystemException class, the IndexOutOfRangeException class, or the ArgumentNullException class. The Exception class has properties, such as the StackTrace property, the InnerException property, and the Message property, that provide specific information about the error that has occurred. The runtime has a base set of exceptions deriving from the SystemException class that the runtime throws when an exception is encountered. Most of the classes that inherit from the Exception class, such as the IndexOutOfRangeException class and the ArgumentNullException class, do not implement additional members. Therefore, the most important information for an exception can be found in the hierarchy of exceptions, the exception name, and the information contained in the exception. When an application handles exceptions, additional information about the exception that is inherited from the Exception class can often be retrieved and displayed to the user. In addition to application, page, and code level, you can also handle exceptions at the HTTP module level and by using an IIS custom handler. You can handle default errors at the application level either by modifying your application's configuration or by adding an Application_Error handler in the Global.asax file of your application. You can handle default errors and HTTP errors by adding a customErrors section to the Web.config file. The customErrors section allows you to specify a default page that users will be redirected to when an error occurs. It also allows you to specify individual pages for specific status code errors. Unfortunately, when you use the configuration to redirect the user to a different page, you do not have the details of the error that occurred. However, you can trap errors that occur anywhere in your application by adding code to the Application_Error handler in the Global.asax file. // Pass the error on to the error page. A page-level handler returns the user to the page where the error occurred, but because instances of controls are not maintained, there will no longer be anything on the page. To provide the error details to the user of the application, you must specifically write the error details to the page. You would typically use a page-level error handler to log unhandled errors or to take the user to a page that can display helpful information. This code example shows a handler for the Error event in an ASP.NET Web page. This handler catches all exceptions that are not already handled within try/catch blocks in the page. "information to resolve the issue." // Clear the error from the server. After you handle an error, you must clear it by calling the ClearError method of the Server object (HttpServerUtility class), otherwise you will see an error that has previously occurred. The try-catch statement consists of a try block followed by one or more catch clauses, which specify handlers for different exceptions. When an exception is thrown, the common language runtime (CLR) looks for the catch statement that handles this exception. If the currently executing method does not contain a catch block, the CLR looks at the method that called the current method, and so on, up the call stack. If no catch block is found, then the CLR displays an unhandled exception message to the user and stops execution of the program. The following code example shows a common way of using try/catch/finally to handle errors. In the above code, the try block contains the code that needs to be guarded against a possible exception. The block is executed until either an exception is thrown or the block is completed successfully. If either a FileNotFoundException exception or an IOException exception occurs, the execution is transferred to a different page. Then, the code contained in the finally block is executed, whether an error occurred or not. Before adding error handling to the Wingtip Toys sample application, you will add error logging support by adding an ExceptionUtility class to the Logic folder. By doing this, each time the application handles an error, the error details will be added to the error log file. Right-click the Logic folder and then select Add -> New Item. Select the Visual C# -> Code templates group on the left. Then, select Classfrom the middle list and name it ExceptionUtility.cs. Choose Add. The new class file is displayed. When an exception occurs, the exception can be written to an exception log file by calling the LogException method. This method takes two parameters, the exception object and a string containing details about the source of the exception. The exception log is written to the ErrorLog.txt file in the App_Data folder. 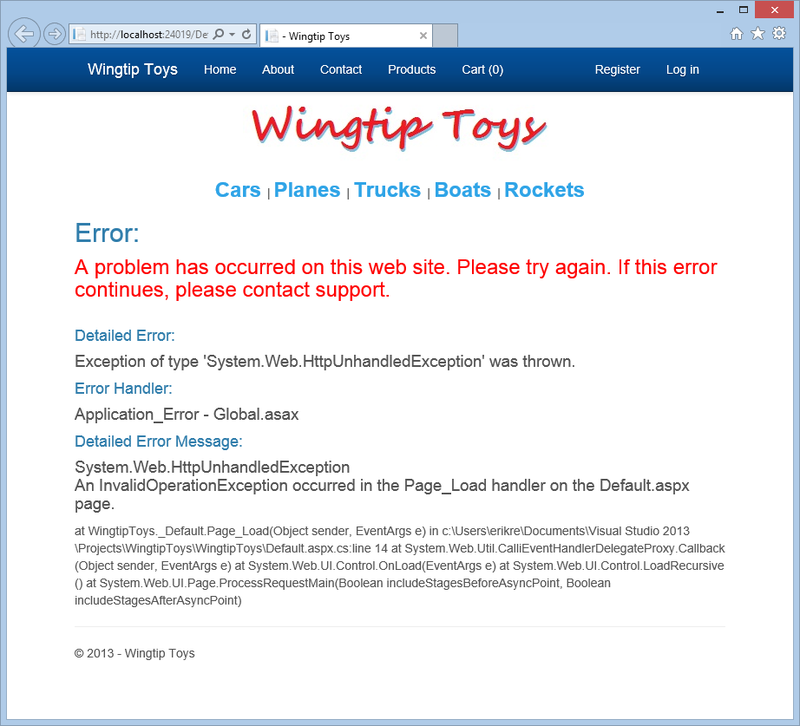 In the Wingtip Toys sample application, one page will be used to display errors. The error page is designed to show a secure error message to users of the site. However, if the user is a developer making an HTTP request that is being served locally on the machine where the code lives, additional error details will be displayed on the error page. 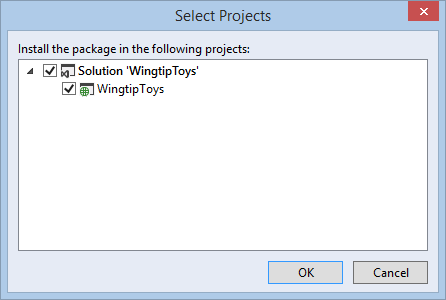 Right-click the project name (Wingtip Toys) in Solution Explorer and select Add -> New Item. Select the Visual C# -> Web templates group on the left. From the middle list, select Web Form with Master Page,and name it ErrorPage.aspx. Select the Site.Master file as the master page, and then choose OK.
// Create safe error messages. // Display safe error message. // Determine where error was handled. // Get the last error from the server. // Get the error number passed as a querystring value. // If the exception no longer exists, create a generic exception. // Show error details to only you (developer). LOCAL ACCESS ONLY. // Show where the error was handled. // Show local access details. When the error page is displayed, the Page_Load event handler is executed. In the Page_Load handler, the location of where the error was first handled is determined. Then, the last error that occurred is determined by call the GetLastError method of the Server object. If the exception no longer exists, a generic exception is created. Then, if the HTTP request was made locally, all error details are shown. In this case, only the local machine running the web application will see these error details. After the error information has been displayed, the error is added to the log file and the error is cleared from the server. By adding a customErrors section to the Web.config file, you can quickly handle simple errors that occur throughout the application. You can also specify how to handle errors based on their status code value, such as 404 - File not found. Update the configuration by adding a customErrors section to the Web.config file. In Solution Explorer, find and open the Web.config file at the root of the Wingtip Toys sample application. The customErrors section specifies the mode, which is set to "On". It also specifies the defaultRedirect, which tells the application which page to navigate to when an error occurs. In addition, you have added a specific error element that specifies how to handle a 404 error when a page is not found. Later in this tutorial, you will add additional error handling that will capture the details of an error at the application level. You can run the application now to see the updated routes. 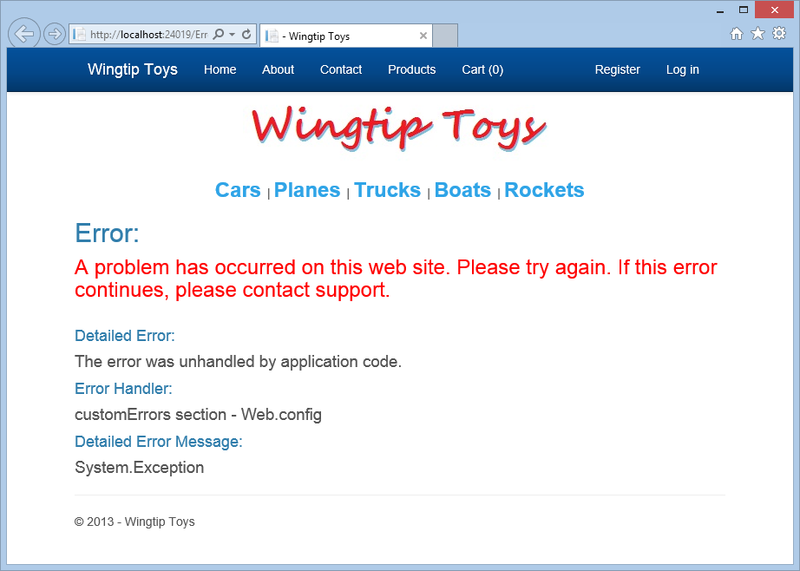 Press F5 to run the Wingtip Toys sample application. The browser opens and shows the Default.aspx page. Review the ErrorPage.aspx displayed in the browser. When you request the NoPage.aspx page, which does not exist, the error page will show the simple error message and the detailed error information if additional details are available. However, if the user requested a non-existent page from a remote location, the error page would only show the error message in red. To verify how your application will function when an error occurs, you can deliberately create error conditions in ASP.NET. 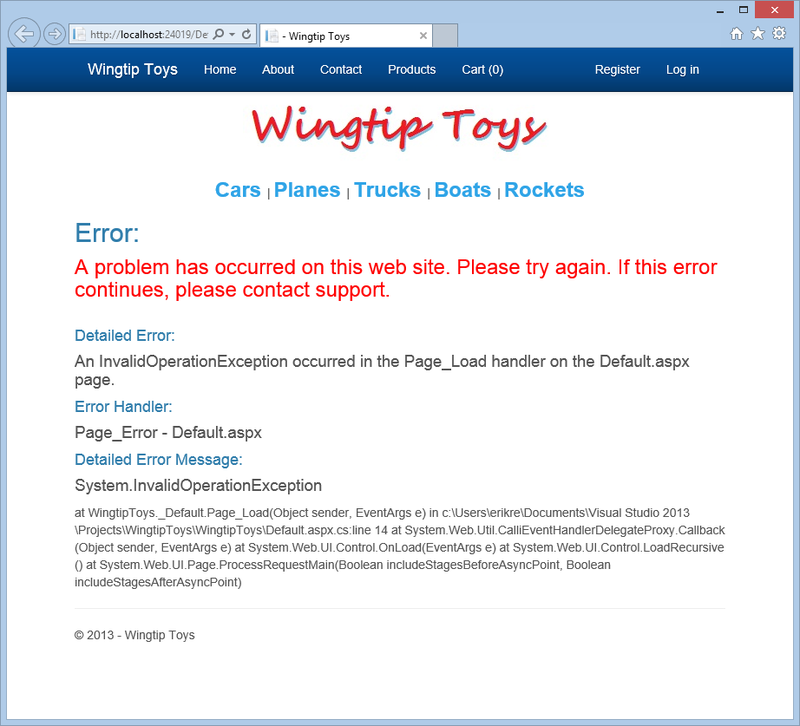 In the Wingtip Toys sample application, you will throw a test exception when the default page loads to see what happens. Open the code-behind of the Default.aspx page in Visual Studio. The Default.aspx.cs code-behind page will be displayed. It is possible to create various different types of exceptions. In the above code, you are creating an InvalidOperationException when the Default.aspx page is loaded. You can run the application to see how the application handles the exception. 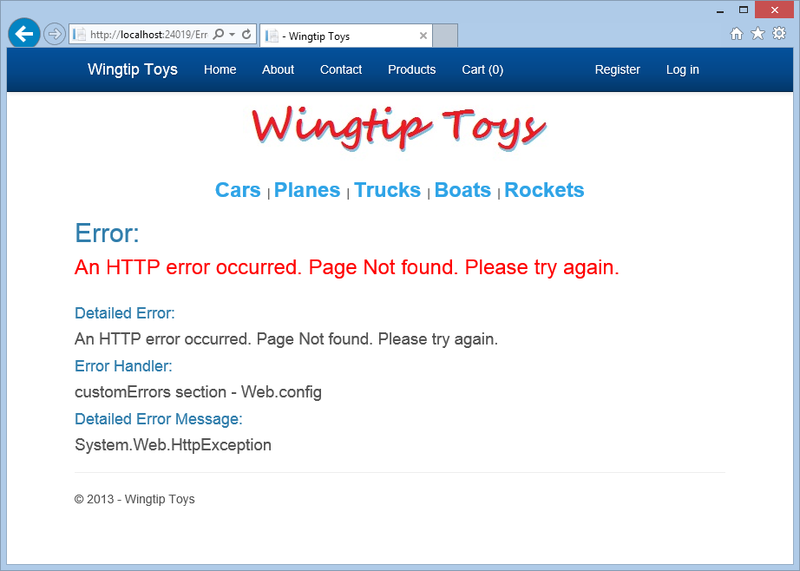 Press CTRL+F5 to run the Wingtip Toys sample application. The application throws the InvalidOperationException. You must press CTRL+F5 to display the page without breaking into the code to view the source of the error in Visual Studio. As you can see in the error details, the exception was trapped by the customError section in the Web.config file. Rather than trap the exception using the customErrors section in the Web.config file, where you gain little information about the exception, you can trap the error at the application level and retrieve error details. In Solution Explorer, find and open the Global.asax.cs file. // Code that runs when an unhandled error occurs. When an error occurs in the application, the Application_Error handler is called. In this handler, the last exception is retrieved and reviewed. If the exception was unhandled and the exception contains inner-exception details (that is, InnerException is not null), the application transfers execution to the error page where the exception details are displayed. You can run the application to see the additional error details provided by handling the exception at the application level. The application throws the InvalidOperationException . You can add page-level error handling to a page either by using adding an ErrorPage attribute to the @Page directive of the page, or by adding a Page_Error event handler to the code-behind of a page. 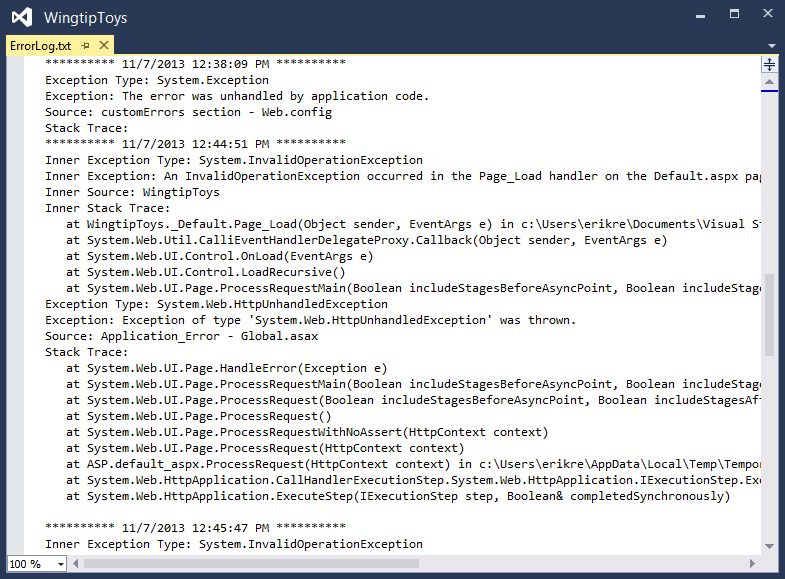 In this section, you will add a Page_Error event handler that will transfer execution to the ErrorPage.aspx page. In Solution Explorer, find and open the Default.aspx.cs file. // Get last error from the server. When an error occurs on the page, the Page_Error event handler is called. In this handler, the last exception is retrieved and reviewed. If an InvalidOperationException occurs, the Page_Error event handler transfers execution to the error page where the exception details are displayed. To allow the Wingtip Toys sample application to function without throwing the exception you added earlier in this tutorial, remove the exception. Open the code-behind of the Default.aspx page. As mentioned earlier in this tutorial, you can add try/catch statements to attempt to run a section of code and handle the first error that occurs. In this example, you will only write the error details to the error log file so that the error can be reviewed later. In Solution Explorer, in the Logic folder, find and open the PayPalFunctions.cs file. The above code calls the LogException method that is contained in the ExceptionUtility class. You added the ExceptionUtility.cs class file to the Logic folder earlier in this tutorial. The LogException method takes two parameters. The first parameter is the exception object. The second parameter is a string used to recognize the source of the error. As mentioned previously, you can use the error log to determine which errors in your application should be fixed first. Of course, only errors that have been trapped and written to the error log will be recorded. In Solution Explorer, find and open the ErrorLog.txt file in the App_Data folder. You may need to select the "Show All Files" option or the "Refresh" option from the top of Solution Explorer to see the ErrorLog.txt file. It is important to note that when your application displays error messages, it should not give away information that a malicious user might find helpful in attacking your application. For example, if your application unsuccessfully tries to write in to a database, it should not display an error message that includes the user name it is using. For this reason, a generic error message in red is displayed to the user. All additional error details are only displayed to the developer on the local machine. A web page to view the entire log of recoded unhandled exceptions. A web page to view the full details of each logged exception. An email notification of each error at the time it occurs. Before you can work with the ELMAH, you must install it. This is easy using the NuGet package installer. As mentioned earlier in this tutorial series, NuGet is a Visual Studio extension that makes it easy to install and update open source libraries and tools in Visual Studio. Within Visual Studio, from the Tools menu, select NuGet Package Manager > Manage NuGet Packages for Solution. The Manage NuGet Packages dialog box is displayed within Visual Studio. In the Manage NuGet Packages dialog box, expand Online on the left, and then select nuget.org. Then, find and install the ELMAH package from the list of available packages online. You will need to have an internet connection to download the package. In the Select Projects dialog box, make sure the WingtipToys selection is selected, and then click OK.
Click Close in the Manage NuGet Packages dialog box if needed. If Visual Studio requests that you reload any open files, select "Yes to All". The ELMAH package adds entries for itself in the Web.config file at the root of your project. If Visual Studio asks you if you want to reload the modified Web.config file, click Yes. ELMAH is now ready to store any unhandled errors that occur. Viewing the ELMAH log is easy, but first you will create an unhandled exception that will be recorded in the ELMAH log. https://localhost:44300/NoPage.aspx The error page will be displayed. In this tutorial, you have learned about handling errors at the application level, the page level, and the code level. You have also learned how to log handled and unhandled errors for later review. 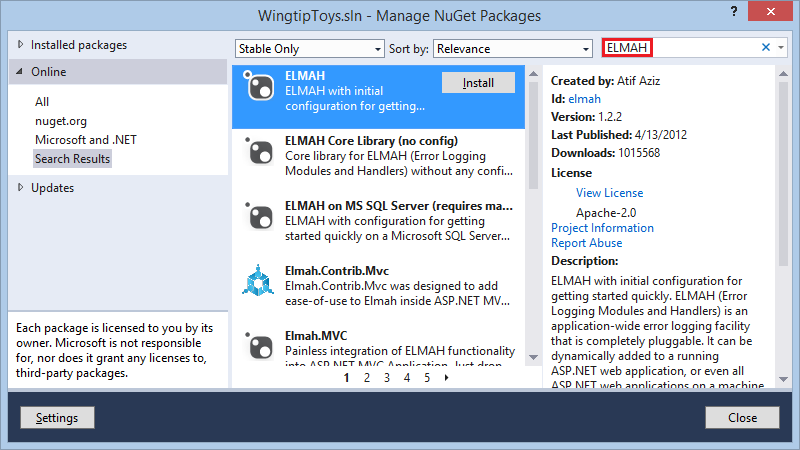 You added the ELMAH utility to provide exception logging and notification to your application using NuGet. Additionally, you have learned about the importance of safe error messages. Thanks for following along. I hope this set of tutorials helped you become more familiar with ASP.NET Web Forms. If you need more information about Web Forms features available in ASP.NET 4.5 and Visual Studio 2013, see ASP.NET and Web Tools for Visual Studio 2013 Release Notes. Also, be sure to take a look at the tutorial mentioned in the Next Stepssection and defintely try out the free Azure trial. Learn more about deploying your web application to Microsoft Azure, see Deploy a Secure ASP.NET Web Forms App with Membership, OAuth, and SQL Database to an Azure Web Site. Publishing your website to Microsoft Azure will save you time, maintenance and expense. It's a quick process to deploying your web app to Azure. When you need to maintain and monitor your web app, Azure offers a variety of tools and services. Manage data, traffic, identity, backups, messaging, media and performance in Azure. And, all of this is provided in a very cost effective approach.